Rocks with a View: NJ Revolutionary War Lookouts ~ The History Girl! Sometimes a historic site does not have to contain a structure or a museum with artifacts. In some cases, a historic resource can include strategic locations where events occurred and history was made. During the Revolutionary War, two locations along the first ridge of the Watchung Mountains provided a natural fortification for the American troops. Rising between 400 and 500 feet, the first ridge of the Watchung Mountains, enabled General George Washington and his troops a natural advantage over the British forces who occupied Perth Amboy, New Brunswick, and lower New York Harbor. From their vantage-point high above, the enemy's movement could be seen from miles away, allowing the American troops time to prepare and thoughtfully plan their next move. Washington's "Fortress Watchung" protected and fed his army: numerous encampments, training schools, supply depots, hospitals, and burial grounds have been located along it between Green Brook and Bridgewater. In the spring of 1777, over 8,000 Continental troops were camped in the Watchung Mountains between Green Brook and Bridgewater, in an area now referred to as the Middlebrook Encampment. Despite several attempts by British General Howe to entice Washington and his troops to the level ground to fight, General Washington refused to move from his secure mountain stronghold. After seeing that Washington would not budge, Howe began to move his troops to Perth Amboy and then Staten Island. Once Washington saw that the coast was clear, he sent troops down to Quibbletown (the New Market section of Piscataway). Once the British obtained this intelligence, they began recalling their troops and headed back toward Quibbletown to meet the Continentals. General Cornwallis anticipated circling behind them and cutting off their retreat to the mountains. Watching these maneuvers from high atop the lookout, Washington realized what the British were attempting and quickly ordered the troops back to their mountain positions. This quick action most likely saved the troops from a disastrous defeat. Keep in mind that at this time, the forests of central New Jersey were much thinner and more open pastures existed, allowing Washington to have an almost unobstructed view. 1844 woodcut from Barber and Howe's Historical Collections of the State of New Jersey. There is debate however, as to where the original Washington Rock was. It can be surmised that Washington stopped at many places along the ridge between Green Brook and Middlebrook to oversee the British and plan his own troop movement. In 1851, Benson J. Lossing traveled about after the Revolution gathering descriptions of events and historic sites for his Field-Book of the Revolution. His drawing of "Washington Rock" is actually a rock located near present-day Hillcrest Road in Bridgewater. 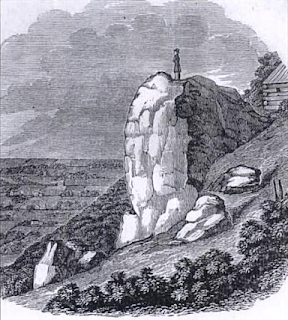 This version of Washington's Rock can be located on several early maps and would have been part of the Middlebrook Encampment. Unfortunately it was not preserved and it is believed that a swimming pool sits atop it. Washington Rock became a very popular tourist attraction in the 1800s. It has been recorded that roughly 2,500 area residents visited the rock on July 4, 1831, for the 75th anniversary of the nation's independence. To accommodate the influx of travelers, a road called Cardinal Lane was constructed for stagecoaches to shuttle tourists between the Plainfield Railway Station and Washington Rock. Many families would spend the day and picnic on the grounds near the rock. Over the ensuing years, many inns and hotels were opened at or near the rock, but none remained in business for very long. The final building, the Washington Hotel, burned in 1881. Today, Cardinal Lane remains unpaved as a hiking trail. In the decades following the American Revolution, many attempts were made to mark Washington Rock in some suitable manner, but it was difficult as the property changed hands many times. Finally, the property was purchased by Mr. Charles McCutchen. Mr. McCutchen realized its significance and held it in trust for the people of Plainfield and North Plainfield. On March 27, 1913, the New Jersey Senate and State Assembly passed an act to acquire Washington Rock and adjoining lands. The act also called for the appointment of a Commission to improve and maintain the site as a public park. The Washington Rock Park Commission was established and three of its appointees were members of the Daughters of the American Revolution. The Commission had the power to acquire the property by deed in the name of the State of New Jersey. The act specified that the park's land could not exceed one hundred acres. The Commission acquired twenty-eight acres. Later, a gift of six acres below the rock was donated, bringing the total acreage to thirty-four. The Continental Chapter of the Daughters of the American Revolution erected a monument at the rock in 1912. Money was raised by public subscription. The monument stands approximately twenty feet above the rock. The Daughters of the American Revolution also constructed a Dutch colonial revival style home in 1912 for a caretaker. The home was built on the former site of the Washington Hotel and later housed a museum and park ranger. Today it sits unused, but Somerset County Parks Commission, now responsible for maintenance and upkeep of the park, is in the process of determining an appropriate use for it. To the southwest of Washington Rock along the ridge is an unusual geological formation that has been affectionately called Chimney Rock. This natural rock formation sticks out of the rock outcropping, resembling a chimney stack. During the Revolution, the area surrounding Chimney Rock was host to thousands of Continental troops. Today, these lands are preserved within Washington Valley Park. To some degree, the eastern section of the park covers a former military fortification that was used by the Continental Army near the site of the 1777-1778 Middlebrook encampment. Remnants can be found in the shape of the earthen walls. The area around Chimney Rock was used to observe movements of the British Army in the plains towards New Brunswick. When the army was stationed at Middlebrook, they covered a large area in the first and second ranges of the Watchung Mountains from Chimney Rock Road to King George Road, which continued all the way down the mountain then) and up to Dock Watch Hollow Road. Within the area of Chimney Rock is an old copper mine called Washington Mine. During the Revolution, the Continental Army briefly operated a copper mine from an outcrop in the area of Chimney Rock and according to legend produced one brass cannon. The old mine was encountered during quarrying operations at the Chimney Rock Quarry as early as 1906 and the encounters with the copper bed continue today. Within the past few years, a piece of native copper weighing over 800 pounds was recovered and donated to the Sterling Hill Mining Museum in Ogdensburg, Sussex County, where it is on display. Just east of Chimney Rock is the Middlebrook camp ground park, part of the Middlebrook encampment of 1778-1779. There were troops hutted on both sides of the gap, and south into what is now Manville. In the spring of 1777, the troops camped just to the north of the gap in the Washington Valley.